I am a Data Scientist with 3 years of experience, and I am hoping you will look at my site and letting me know what you think. I am a motivated and articulate professional. First, I received perfect score for Machine Learning course from Andrew Ng, Stanford University in Coursera in 2014. In Addition, I received Course Certificate with Distinction for Data Analysis and Statistical Inference from Dr. Mine Çetinkaya-Rundel, Duke University in Coursera in 2015. Finally, I completed Data Analyst Nanodegree in Udacity in 2016. My skills include data science, machine learning, computer science, and statistics. Implement A/B Testing to test warning message to prevent non-committed users. Developed as part of Udacity Data Analyst Nanodegree projects. Technologies used: Python and R.
Identify whether time it tooks for participants is statistically significant when reading in congruent words and incongruent words. Technologies used: Python, Pandas, and R.
Technologies used: Python and MongoDB. Technologies used: R,RStudio,ggplot,Chi-Square Independence Test. 7Langit collaborated with Nestle Indonesia to promote its newest product Smoovlatte, using game as the main campaign. The team consist of iOS Developer, Android Developer, Game Developer, and 2 Designers. Acts as a Game Developer, create and maintain the game part of Smoothlife. Using C++ Cocos2d-X cross-platform for iOS and Android. Team: 6 people, Android Developer, Game Developer, iOS Developer, and three Designers. 7Langit collaborated with Nestle MILO, creating 9 games competition for 9 consecutive weeks. Box2D(Fluid,Collision Detection), game controller,game update, communicate between games-iOS,games-Android(jni/NDK), implementing graphical objects with physics, parallax, multi-resolution with wide range of various devices( tested 10+),3D physics-like,bicycle physics, particle system, accelerometer, AI, level design. Using Cocos2d-X C++ engine to create cross-platform mobile games for iOS and Android. This is the first game that 7Langit launched. Act as the only developer, create racing game. PT. Java Festival Production collaborated with 7Langit to create mobile apps for its event, Java Jazz Festival 2015. The team consist of 4 team, iOS Developer, Android Developer, Backend Developer, and Designer. As Backend Developer, job responsibility include delivering content from PT. Java Festival Production, schedule, artist info, ticketing to iOS and Android apps. Also responsible for creating database for storing information about users and push notification. Using Python and Google App Engine Framework. PT. Java Festival Production teamed up with 7Langit to provide its mobile app for the Soundsfair 2014 event. The team consist of iOS Developer, Android Developer, Backend Developer, and Designer. Act as a Backend Developer, using Python Google App Engine to provide data for iOS and Android Developers. 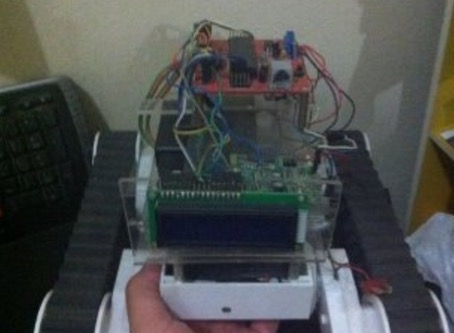 Designing and implementing Artificial Inteligence system for Robotics. Using A* algorithm to determine best path for the robot to move from its location to destination. Using WxWidgets C++ to design and the logics of interactive apllication on the system side. Using C AVR for robot's side.